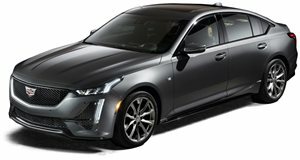 Last month, Cadillac unveiled its new CT5 fastback sedan online, the replacement for both the ATS and CTS. And now it’s making its official live debut here at the 2019 New York Auto Show. There’s no question the CT5 takes a number of design cues straight from the well-received Escala concept and the larger CT6, but it also displays GM’s luxury brand’s latest technologies, specifically the Super Cruise hands-free driver assistant system. Set to go on sale in 2020, the CT5 will be offered in Luxury, Premium Luxury, and Sport trims. The latter features darker accents, unique grilles, fascias, rocker extensions, a spoiler and 19-inch wheels (18-inchers are standard) for a more performance-influenced appearance. Under the hood lies a 2.0-liter twin-scroll turbo four with 237 hp and 258 lb-ft of torque. The optional engine, offered on the Premium Luxury and Sport models, is a 3.0-liter twin-turbo V6 rated at 335 hp and 400 lb-ft. Both turbo motors feature direct injection and are paired to a 10-speed automatic transmission, which feeds power to the rear wheels. All-wheel drive is optional on all trims. This is the same RWD drive architecture that underpins the Camaro. Like the dynamic exterior design and its all-LED lighting, the interior represents a significant step forward for Cadillac styling. There are wide surface lines and simple interfaces throughout. At the center of it all, there’s a 10-inch diagonal touchscreen mounted high within the instrument panel for maximum visibility. The Premium Luxury and Sport models will be offered with a Platinum Package that tacks on Sedona/Jet Black motif with Opus semi-aniline leather seating whose surfaces are distinguished with a custom, layered fading perforation pattern. Both front seats feature 18-way adjustability and there’s additional carbon fiber trim and a thicker-rimmed steering wheel with magnesium paddle shifters and alloy pedals. And then there’s Super Cruise. Previously reserved for the CT6, this system allows drivers to go hands-free on over 130,000 miles of limited-access freeways in North America. The optional Super Cruise is not a complete self-driving system, but it does help make driving (or lack thereof) a bit more relaxing for owners. Brembo front brakes are optional and are standard on Sport models. All CT5s, however, benefit from four selectable driver modes – Tour, Sport, Snow/Ice, and My Mode. Some standard safety features include Forward Collision Alert, Emergency Braking, and Front Pedestrian Braking while Advanced Adaptive Cruise Control, Automatic Parking Assist, HD Surround Vision, and Reverse Automatic Braking are optional. Official pricing is not yet available but orders will get underway this fall.